I love corn in any form, especially sweet corn which is my favorite. Sweet corn is loved by adults and kids alike because of its sweet flavor. So why can't we prepare some healthy quick recipes with sweet corn? You know, this vegetable is a great source of vitamins and minerals. Moreover, consumption of sweet corn benefits to memory enhancement, prevention of cancer, vision protection and so on. So pack your kids with this quick and easy school lunch recipe / sweet corn dishes. Sure they will love this and ask for more. Some quick snacks will be delicious but somehow we must stay away from such fried snacks as they are unhealthy. Instead, try some healthy snacks for your family. This masala sweet corn recipe is a very quick and healthy snack recipe that can be savored with a nice cup of coffee or tea. You can make variation in this recipe according to your taste and preference. For kids, you can reduce the spice level and can add some veggies along with this. You can also just mix all those ingredients along with sweet corn and serve. I just toss everything in melted butter which enhance the taste of the entire dish. 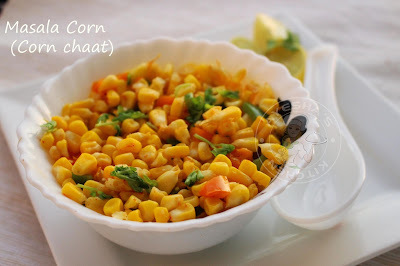 Hope you all will try this fresh corn recipes/corn dishes. 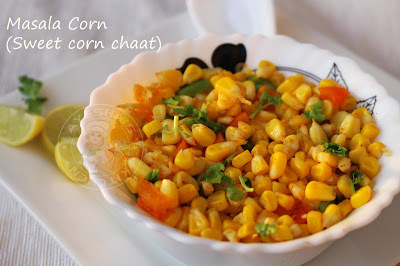 So here is the recipe showing how to make masala corn or corn chaat/recipes for sweet corn/corn recipes easy / frozen corn recipes /sweet corn kennels recipes. Pressure cook fresh sweet corn cob ( take 1 or 2 corn cobs & cut into halves) for 3 whistles with enough water and salt. When done, let it cool and remove the corn kernels with your hands. Set aside in a bowl. You can use frozen corn also. If so you can steam the corn kernels instead. Now heat a pan with butter and add bell pepper (optional), corn kernels, chilli powder, chat masala and salt. Mix well and stir for a minute. Switch off the flame and add lemon juice and garnish with chopped coriander leaves. Please subscribe my YOU TUBE CHANNEL - Click here for cooking video recipes.